The Raw-only pay-per-view event Clash of Champions is set to take place Sunday. With the recent Backlash being the first brand-specific pay-per-view from WWE since 2007, let’s look back on the old PPV model and consider how effective the previous brand-split era was for drawing PPV buys. April 2002 to May 2003: after the brand-split began, but before there were brand-specific PPVs; both RAW and SmackDown talent appeared on each PPV. June 2003 to February 2007: when there were brand-specific B PPVs; on major PPVs talent from both brands still appeared. April 2007 to July 2011: when all PPVs went back to being joint-brand events, although the brand-split remained in effect. August 2011 to February 2014: after the brand split was ended, but before the WWE Network was launched. For the record, for the entirety of the original brand-split, RAW-only PPVs edged out SmackDown-only PPVs for average buys. RAW averaged 283,421 while SmackDown averaged 248,833. There were 19 RAW-only PPVs and 18 SmackDown-only. The biggest RAW PPV was Vengeance 2005 (420,000 buys), headlined by Batista vs. Triple H in a Hell in a Cell Match. The biggest SmackDown PPV was Vengeance 2003 (365,000 buys), headlined by Brock Lesnar vs. Kurt Angle vs. Big Show. The poorest-performing RAW PPV was Taboo Tuesday 2004 (174,000 buys), which had Randy Orton vs. Ric Flair as biggest known match ahead of time. The poorest-performing SmackDown PPV was No Mercy 2004 (183,000 buys), main evented by JBL vs. Undertaker. One of the main reasons WWE began doing brand-specific PPVs was so they could run more PPV events per year, and, in theory, draw more buys (and therefore more PPV revenue) per year as a result. Let’s see if that’s how it went. Total buys went down in 2004 despite the extra PPVs, but then went up in 2005 when the count was upped to 15. The company pushed further with 16 in 2006 and buys went back down. Buys decrease further as WWE cut back to 15, 14 and 13 in the following years. 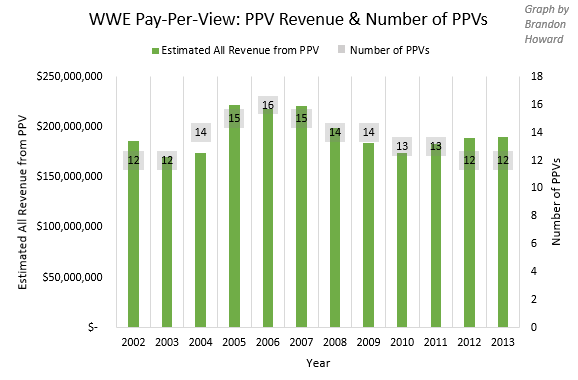 The answer is the increase in PPV price did somewhat offset the decrease in buys, but not completely. As WWE did more PPVs going into the mid-2000s, the company generated more money for itself and its PPV partners. As it did fewer of these events, from 2007 forward, it generated less revenue, but managed to generate more when cutting from 13 to 12 PPVs in 2012 and 2013. You could make the argument from this analysis that the optimal number of PPVs, in terms of economic value, is around 15 or 16 per year. Granted, that’s not adjusting for any changes in WWE’s overall popularity over these years (although I would argue popularity has been relatively stable over that period), nor does it address changes to the dynamics of PPV/special event economics brought on by the advent of the WWE Network. Nonetheless, under the new brand-split, WWE seems to be on track to do an all-time high 20 PPVs per year: four major joint-brand PPVs and two brand-specific in each of the eight months without a major one. Of course, while most are paying just $9.99 per month for the Network instead of $44.95 per PPV, WWE is asking far less in terms of payment from its customers. In fact, it’s asking for exactly the same payment for 20 PPVs per year as it was when only offering 12. Those inside the company probably view more PPVs as adding more value in exchange for the cost of subscription, and thus, in theory, attracting and maintaining more subscriptions to the all-important Network. The natural complaint in response to that is 20 PPVs per year is just too much to keep up with, and once you start making PPVs nonessential viewing, you dilute the value of all PPVs and risk disengaging your fanbase. In that respect, it probably would have been more prudent to go with 15 to 16 PPVs annually and see how the subscriber base responded to that, how viewership rates on the Network for those events held up (which are only known internally, and never released publicly). However an increase in the number of PPV events will surely give a slight nudge to WWE’s already healthy live event business. On an extra eight Sundays per year, the company will be able to run an additional PPV event they wouldn’t have run otherwise, charging higher ticket prices and almost certainly drawing a higher attendance compared to the Sunday house show events that would have been run instead on those days. Plus, the brand-split will further help live event business by allowing WWE to run more house shows since they now have two distinct main talent rosters. While oversaturation is a legitimate concern, using the brand-split to produce more pay-per-view events, and more live events overall, will probably help the company’s bottom line more than hurt it, at least in the short-term. As always, the ultimate common denominator for WWE’s business is how well it can cultivate star power: something that, while being an efficiently-run business, the company hasn’t done an exceptional job at in many years. Pay-per-view buys were collected from the prowrestlinghistory.com's excellent records. Additional calculations were made using this spreadsheet. Timing of changes to WWE PPV prices were verified by checking WWE's 10-K SEC filings.